A new paper published in the Open Journal of Atmospheric and Climate Change by renowned professor of physics and expert on spectroscopy Dr. Hermann Harde finds that climate sensitivity to a doubling of CO2 levels is only about 0.43C, about 7 times less than the IPCC claims, but in line with many other published low estimates of climate sensitivity. The paper further establishes that climate sensitivity to tiny changes in solar activity is comparable to that of CO2 and by no means insignificant as the IPCC prefers to claim. The following is a Google translation from the German EIKE site with an overview of the main findings of the paper, followed by a link to the full paper [in English]. The "climate sensitivity" said quantity was invented to carry the presumption in meaningful ways into account that the global mean temperature of the atmosphere could possibly be driven in a certain way by increase in carbon dioxide concentration in the air. To this end, forces defined (postulated) called. "Forcings", whose influence, by means of certain physically based and mostly plausible assumptions, to accomplish this increase as migration out of balance. One of the factors is required for the climate sensitivity. It indicates how much K (° C) doubling the heating of the CO2 concentration rises. Our understanding of past and current changes in our climate is based partly on observations, but also on studies of feedback processes and modeling for climate. In this work, an advanced two-layer climate model is presented, which is specifically geared to the influence of rising CO2 to calculate concentration in the atmosphere on global warming and the effects of a changing solar activity on our climate. The model describes the atmosphere and the earth surface than two layers, which act simultaneously as absorber and Planck radiator. In equilibrium, thereby giving the earth as the atmosphere about the radiation and the heat exchange between the layers as much power again, as they absorb from the sun and the neighboring location. An external fault, which may have their origin in a change in solar activity or the concentration of greenhouse gases, changes the balance and thus leads to altered average temperatures of the earth and the atmosphere. The model takes into account the short-wave and long-wave scattering of radiation in the atmosphere and clouds, in particular multiple-scattering and reflections between the surface and the clouds is included. It also takes into account the usual feedback processes such as changes in water vapor concentration, the temperature gradient with height (lapse rate), or albedo. In addition, but also the temperature-dependent heat fluxes by convection and evapotranspiration as well as induced by temperature and solar influence changes in cloud cover degree and whose repercussions are included on the balance with. While climate models radiation losses and their impact on the energy balance usually describe for the radiative forcing, in this work, changes in greenhouse gas concentrations are directly attributed to the short-term and long-wavelength absorption of these gases so that the key parameters in the representative model shown here. The absorptions by the major greenhouse gases water vapor, carbon dioxide, methane and ozone are determined from single-line calculations that rely on the HITRAN08 database and for the solar radiation the spectral range from 0.1 to 8 microns , for the infrared range the spectrum of 3-100 microns cover. Due to the changing concentrations of greenhouse gases and atmospheric pressure with the ambient temperature and the height above the ground, the calculations for up to 228 sub-layers of the earth's surface into 86 km altitude, and additionally for three climate zones, the tropics, middle latitudes and the polar regions is performed. Then the absorbance change with increasing CO2 concentration to detect these bills for 14 different concentrations are 0 - 770 ppm repeated under otherwise identical conditions. The changing propagation length of sunlight in a lower layer, which depends on the angle of incidence of the radiation to the atmosphere and thus on the latitude and longitude is taken into account by representing the earth as a truncated icosahedron (bucky ball) that the 32 surface elements with well-defined angles incident radiation is and then each of these areas is assigned to a climate zone. The propagation of long-wave radiation, especially the radiation emitted by the atmosphere itself radiation in downward and upward direction which is substantially dependent on the temperature distribution in the vertical direction is calculated separately with an extended model for radiative transfer for each climate zone. The short and long wavelength spectra show a pronounced saturation behavior with increasing water vapor and CO2concentration and a strong mutual overlap. Both effects lead to a significant weakening of the greenhouse effect with increasing concentration. 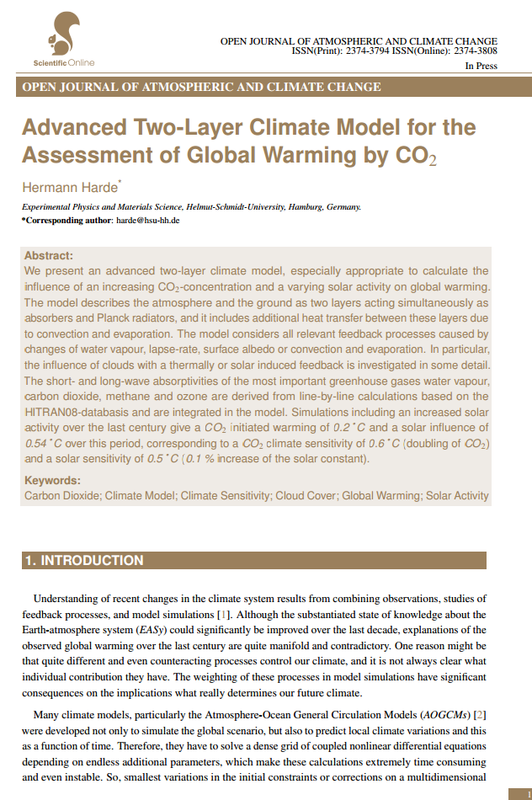 The method presented here relies on the climate model calculated in this work short-term and long-wavelength absorptions to Decrease the surface temperature and lower troposphere temperature as a function of CO2 to determine concentration. The temperature rise in a doubled CO2 concentration then provides directly the CO2equilibrium climate sensitivity. Different scenarios for cloud-free and cloudy sky regularly be examined in detail, this. Taking into account all significant feedback effects and solar influences Corresponding simulations show the dominant influence of cloud cover change on global warming, this is triggered by a thermal and / or solar-induced cloud feedback. In particular, is clearly due to this strong influence of clouds that the measured warming in the last century can only be explained satisfactorily if a significant fraction is associated with an increased solar activity. The simulations yield a CO2 -initiated warming of 0.2 ° C ( 100 ppm CO2 -Anstieg) and a solar fraction of 0.54 ° C over this period. This corresponds to a CO2 climate sensitivity of 00:56 ° C (doubling of CO2 ) and a solar sensitivity of12:54 ° C ( 0.1% increase in the solar constant). These results are in clear contradiction to the representations of the IPCC , the temperature rise over the last century exclusively anthropogenic emissions of greenhouse gases ( 95%assigns probability) and a climate sensitivity between 1.5 ° C and 4.4 ° C starts, during any influence is denied by the sun. and for three climate zones. - Detailed radiative transfer calculations for the downward and upward infrared radiation, based on a novel and generalized radiative transfer model. - It determines the energy balance and heat transfer by radiation between Earth's surface and atmosphere under equilibrium conditions. - It uses the calculated short-term and long-wavelength absorption and the upward and downward radiative fluxes in the atmosphere as a key parameter for the climate model. - It takes into account clouds influences and multiple scattering of short and long wave radiation by clouds and the atmosphere. - The radiation and heat fluxes are calibrated to the corresponding satellite data. - The model reacts to changes Bewölkungs with a bottom temperature change applied to the ISCCP -Observations over the period 1983 - 2010 are adjusted. - It takes into account the well-known feedback processes by water vapor, changes in the vertical temperature distribution of the atmosphere as well as by changes in reflectance at the surface. - In addition, a temperature-dependent heat transfer by convection and evapotranspiration is incorporated, processes, which are not considered in other climate models. - The model also takes into account a thermally induced cloudiness change as a feedback process that is driven determined by both the greenhouse gases such as by a change in radiation intensity of the sun and the instrumental climate as well as the solar sensitivity. - Alternatively, a non-thermally induced, purely solar stimulated cloudiness change is considered, which acts exclusively on the solar sensitivity and the climate sensitivity unchanged. - The spectra show very strong saturated absorption for water vapor and CO2 and a significant overlap and mutual influence of these gases the amount of CO2 significantly limit the greenhouse effect. - For the radiative transfer calculations for the three climate zones, the ratio of the votes of the atmosphere heat radiation to the ground and all can be determined. - There are first presented calculations on the influence of clouds on the global temperature at the ISCCP based -Observations. - The presented simulations allow a clear distinction between results that are valid for cloud-free and cloudy sky and the dominant influence of cloudiness on global temperature as reflect on the climate sensitivity. - Climate sensitivity over medium cloud cover ( 66% ) is only half as large as under cloud-free conditions. o water vapor feedback: It is determined from the Spektralberechnungen for the three climate zones and provides a significantly lower contribution than in the IPCC Reports with listed. It consists of a stronger positive part, caused by the long-wave absorption increases with the temperature, and a smaller damping share by short-wave radiation. The linear increase in absorbance with temperature arises from the exponential increase in water vapor concentration according to the Clausius-Clapeyron -law other hand, a logarithmic increase in the absorption of the vapor concentration due to the spectral saturation effects. o Vertical temperature change : Due to the changing radiation fluxes in upward or downward direction in modified vertical temperature distribution in the atmosphere (lapse rate) results in a resultant positive feedback contribution in contrast to those in the literature, where ia is assumed to be slightly negative feedback. o surface albedo : From the IPCC accepted. o Convection: With increasing CO2 concentration, the temperature of the lower troposphere increases less rapidly than the ground temperature. As a result of heat flow increases due to convection and conduction of heat from soil to the atmosphere, and further contributes to a negative feedback on. o Evapotranspiration : Also increases with increasing soil temperature of the latent heat flux and thus contributes to a significant negative feedback contribution. o Thermally induced cloudiness change : A thermally driven change of cloudiness can be caused by greenhouse gases, in this case CO2 , and also by variations in the solar radiation power. Changes in cloudiness cause a strong positive feedback, which in this case affects both the climate like in the solar sensitivity. o Non-thermal solar induced cloudiness change : The cloud cover can also be affected by cosmic radiation and / or increased UV radiation, both of which are caused by changes in solar activity. This feedback acts only on the solar sensitivity and lets the climate sensitivity unaffected. - Due to the different effects of the two cloud effects on global warming, the simulations allow a distinction between thermal and solar-induced cloud changes as well as an indication of the weighting of these contributions. o Without any thermal or solar-induced cloudiness change, but taking into account all other relevant feedback processes (water vapor, vertical distribution of temperature, albedo, convection and evapotranspiration), the climate sensitivity to calculate CS = 00:43 ° C .
This very low value is due to the highly saturated steam - and CO2 absorption, low water vapor feedback and the negative feedback by convection and evapotranspiration. o CO2 induced thermal Bewölkungs feedback (in accordance with the ISCCP -Observations for cloudiness change), but not including the solar thermal component results in a maximum climate sensitivity of CS = 1.73 ° C .
A rise to 100 ppm CO2 over the last century would under these assumptions, then to a global warming of 0.6 ° Ccontribute. o With thermally induced Bewölkungs feedback, caused by CO2 and increased solar activity of 0.2% over the last century, an unrealistically high global warming would 1:32 ° C ( 0.6 + 0.72 ° C ) result. o Without thermal but solar induced Bewölkungs feedback (in accordance with the ISCCP -Observations for cloud modification) a climate sensitivity of is CS = 12:43 ° C and a solar sensitivity of SS = 12:32 ° C calculated. With an increased solar activity of 0.2% over the last century then controls the solar heating of 0.64 ° C and CO2only 0.1 ° C when measured in accordance with the global warming of 0.74 ° C .
o For a lower solar activity of only 0.1% and also a smaller underlying negative convection and Evapotransipirations feedback results in a climate sensitivity of CS = 0.56 ° C, the solar sensitivity to SS = 0.54 ° C .
then controls CO2 0.2 ° C and the Sun 0.54 ° C warming effect. To all boundary conditions of increased solar activity and CO2 concentration over the last century to meet, and this is in agreement with the observed warming and the change of cloud cover during the period 1983-2010 , is a combination of both cloudiness influencing mechanisms used with a thermal share of 9% and a dominant solar contribution of 91%. o A value for the equilibrium climate sensitivity of ~ 0.6 ° C makes it more likely represents an upper limit for this. If a solar anomaly of 0.2% based on, this value is reduced to only ~ 0.4 ° ​​C. influence of an increasing CO2-concentration and a varying solar activity on global warming. the influence of clouds with a thermally or solar induced feedback is investigated in some detail. and a solar sensitivity of 0.5 ˚ C (0.1 % increase of the solar constant). This compares quite well to Lindzen's calculations as well. There can be little doubt now CAGW is disproven. As for AGW, the jury is still out on that. There is a strong possibility that ECS is essentially zero due to saturation. Indeed, it would indicate that two doublings from 400ppm to 1600ppm would raise the temperature by 0.86 deg C. At current rates that would take 800 years. I don't think there is much to that requiring spending a lot of cash or changing the underpinnings of civilisation. It's just another modelling attempt, all of which by definition assume the basic operative physics (causes and effects) of atmospheric warming are known and settled, when they quite obviously are not (that the various models give substantially different values for the climate sensitivity should have made this absolutely clear, by now). My Venus/Earth temperatures comparison simply shows the CO2 climate sensitivity is precisely zero--there is no such thing as the "greenhouse effect", in the real world...only in the misdirected and basically incompetent models of supposed experts. The "debate" between alarmist and lukewarm believers in that "effect" is obsessive and completely in vain. When I designed IC's decades ago, we modeled the devices before committing to silicon. If I didn't have reliable inputs, the assumptions made would either be proven or disproved by the function or malfunction of the device. If the devices failed, we would naturally adjust our modeling assumptions based on new real-world information. Had my models failed as badly as these climate models failed, I would never have produced a single working IC, and wouldn't have built a company that grew to 3500 employees. In any other world beyond government, this level of catastrophic failure would be cause to be dismissed...not a reason for further funding. At some point, their failure must no longer be funded. "At some point, their failure must no longer be funded." In an ideal world, that would be the case, unfortunately it's now a self-perpetuating government-climate-industrial complex that constantly works to ensure it's survival. There is absolutely no other way to explain how the necessary energy gets into the surfaces of Earth and Venus than by non-radiative heat transfer, because the intensity of solar radiation just is nowhere near enough. It's not hard to understand once you understand what thermodynamic equilibrium is all about, and if you have no idea why this is important to understand then you are best either working it out for yourself, reading my book "Why It's Not Carbon Dioxide After All" or keeping out of all discussion pertaining to planetary temperatures, because these temperatures are not determined by radiation alone - not by a long shot, and the world has been very seriously misled by the biggest scientific blunder of all time. harmonically in same orbit directions. Water vapour is far more potent as a "greenhouse gas" than CO2. Why doesn't a small increase in water vapour cause runaway heating? How does the atmosphere know to go into a runaway heating mode because of an increase in CO2 but not an increase in water vapour? Generally in any positive feedback situation any trigger will cause a runaway situation. If an increase in CO2 will cause heating than an even smaller increase in water vapour for any reason should cause the same effect. Or there is a stronger negative feedback effect keeping the system stable regardless of changes in CO2 or water vapour. Since CO2 reflects infra-red, any increase in CO2 will reduce energy input as there is far more infra-red coming from the Sun then there is infra-red being emitted to space. It's like the old joke that a Thermos keeps hot things hot and cold things cold. How does it know what to do? How does CO2 know to keep infra-red from escaping the earth while not blocking it from the sun? All this so called science surrounding CAGW is about the same level. MS - Just out of curiosity, what is the joule content of IR transmission from earth compared to the IR reception from the Sun. You say the Earth emits more than it receives, but fail to give numbers or site sources. Prof. Harde seriously overestimates water vapor in the free troposphere.. Basically he does not think about rainout. Thank you for this post, I agree on the whole. A minor weakness is that I don't think that the drive by CO2 alone without feedback 3.5 W / m ² (or whichever canonical, whatever) is so sure. Most people are not able to verify this, because it takes a complex radiative transfer calculation with thousands of CO2 and H2O lines, which absorb and emit in many heights at very different temperatures. Freeman Dyson, and I have tried us to address this problem, and we believe that the number many tens percentage is too high. Because there's much less absorption in the far outer wings of the conflict extended [collision-broadened,?] Lines, as you can imagine the Lorenz'sche shape of the lines. There is good experimental evidence for Sub-Lorenz'sche wings, and you would expect that even in theory, if the collision lines are not infinitesimally short (giving it a Lorenz'sches appearance), but occur over a few picoseconds - what is certainly the case.